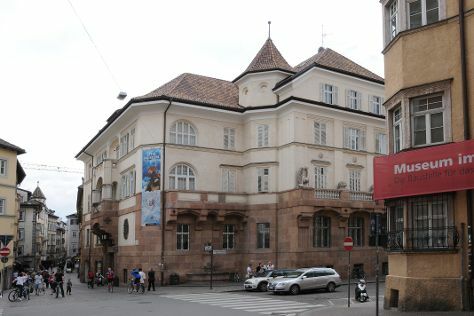 To see more things to do, ratings, other places to visit, and tourist information, refer to the Basel visit planner. Reykjavik, Iceland to Basel is an approximately 7.5-hour combination of flight and bus. You can also do a combination of flight and train; or do a combination of car and ferry. Due to the time zone difference, you'll lose 1 hour traveling from Reykjavik to Basel. Prepare for a bit warmer weather when traveling from Reykjavik in May: high temperatures in Basel hover around 22°C and lows are around 10°C. Wrap up your sightseeing on the 1st (Wed) to allow time to take a train to Zurich. Start off your visit on the 2nd (Thu): contemplate the waterfront views at Lake Zurich, take in the spiritual surroundings of Fraumünster Church, and then wander the streets of Old Town (Altstadt). To find more things to do, maps, reviews, and tourist information, you can read our Zurich tour itinerary builder tool . You can take a train from Basel to Zurich in an hour. Alternatively, you can drive; or take a bus. In May, daily temperatures in Zurich can reach 21°C, while at night they dip to 9°C. Finish your sightseeing early on the 3rd (Fri) to allow enough time to drive to Lucerne. On the 3rd (Fri), contemplate the long history of Museggmauer, then pause for some serene contemplation at Franziskanerkirche, and then pause for some serene contemplation at Jesuitenkirche. To find traveler tips, reviews, photos, and other tourist information, read our Lucerne trip planner . Traveling by car from Zurich to Lucerne takes an hour. Alternatively, you can take a shuttle; or take a train. May in Lucerne sees daily highs of 21°C and lows of 10°C at night. On the 3rd (Fri), wrap the sightseeing up by early afternoon so you can drive to Interlaken. To find traveler tips, ratings, photos, and tourist information, refer to the Interlaken online vacation builder . You can drive from Lucerne to Interlaken in an hour. Alternatively, you can take a shuttle; or take a train. In May, daytime highs in Interlaken are 20°C, while nighttime lows are 8°C. 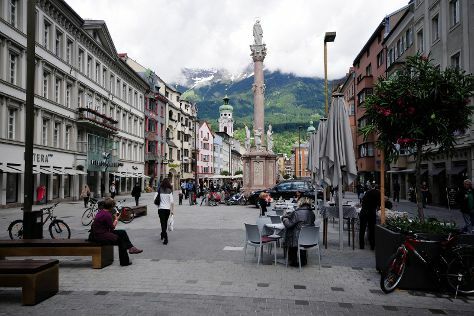 Cap off your sightseeing on the 3rd (Fri) early enough to go by car to Locarno. To see traveler tips, reviews, more things to do, and tourist information, refer to the Locarno vacation maker website . Getting from Interlaken to Locarno by car takes about 3 hours. Other options: take a train. Plan for somewhat warmer temperatures traveling from Interlaken in May, with highs in Locarno at 24°C and lows at 13°C. You will leave for Lugano on the 4th (Sat). On the 4th (Sat), pause for some serene contemplation at Chiesa San Carlo Borromeo, pause for some serene contemplation at Chiesa di Santa Maria degli Angeli, and then take in the awesome beauty at Monte San Salvatore. To see where to stay, maps, other places to visit, and other tourist information, read Lugano online vacation planner . You can drive from Locarno to Lugano in an hour. Other options are to take a train; or do a combination of bus and train. 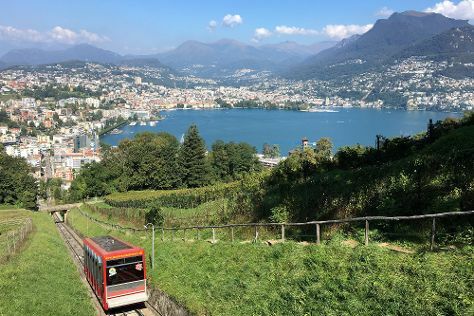 In May, daytime highs in Lugano are 24°C, while nighttime lows are 13°C. Wrap up your sightseeing on the 4th (Sat) early enough to drive to St. Moritz. To find more things to do, maps, where to stay, and other tourist information, you can read our St. Moritz trip tool . Drive from Lugano to St. Moritz in 3 hours. Alternatively, you can take a bus. Expect little chillier temperatures when traveling from Lugano in May; daily highs in St. Moritz reach 15°C and lows reach 5°C. You'll set off for Bolzano on the 5th (Sun). South Tyrol's capital, Bolzano, has been named the Italian city with the highest quality of life. On the 5th (Sun), take an in-depth tour of South Tyrol Museum of Archaeology and then tour the pleasant surroundings at Il Salto/ Salten. To find traveler tips, photos, maps, and tourist information, go to the Bolzano road trip planning app . Traveling by car from St. Moritz to Bolzano takes 3 hours. Expect somewhat warmer temperatures when traveling from St. Moritz in May; daily highs in Bolzano reach 28°C and lows reach 13°C. 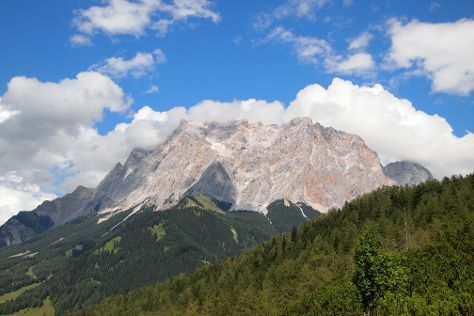 Wrap up your sightseeing on the 5th (Sun) to allow time to drive to Cortina d'Ampezzo. Cortina d'Ampezzo, commonly referred to as Cortina, is a town and comune in the heart of the southern (Dolomitic) Alps in the Veneto region of Northern Italy. For ratings, photos, reviews, and more tourist information, go to the Cortina d'Ampezzo day trip site . Traveling by car from Bolzano to Cortina d'Ampezzo takes 2 hours. Alternatively, you can take a bus; or do a combination of train and bus. In May, daytime highs in Cortina d'Ampezzo are 28°C, while nighttime lows are 13°C. On the 5th (Sun), you'll travel to Hofen. Kick off your visit on the 6th (Mon): ski along the peaceful trails at Reuttener Seilbahnen and then contemplate the waterfront views at Heiterwanger See. To find traveler tips, ratings, where to stay, and other tourist information, read Hofen tour app . You can drive from Cortina d'Ampezzo to Hofen in 4 hours. Plan for slightly colder temperatures traveling from Cortina d'Ampezzo in May, with highs in Hofen at 19°C and lows at 7°C. Finish up your sightseeing early on the 7th (Tue) so you can travel to Garmisch-Partenkirchen. Start off your visit on the 7th (Tue): fly down the slopes at Zugspitze. To find where to stay, reviews, maps, and other tourist information, refer to the Garmisch-Partenkirchen day trip planning tool . You can drive from Hofen to Garmisch-Partenkirchen in an hour. In May, daily temperatures in Garmisch-Partenkirchen can reach 22°C, while at night they dip to 9°C. Wrap up your sightseeing on the 7th (Tue) early enough to drive to Innsbruck. To see traveler tips, ratings, other places to visit, and more tourist information, go to the Innsbruck online visit planner . Getting from Garmisch-Partenkirchen to Innsbruck by car takes about an hour. Other options: take a bus; or take a train. In May, plan for daily highs up to 22°C, and evening lows to 9°C. Wrap up your sightseeing on the 7th (Tue) to allow time to drive to Hallstatt. On the 8th (Wed), take in the spiritual surroundings of Hallstatt Lutheran Church, choose your vessel at Lake Hallstatt Explorer, and then take in the pleasant sights at Old Town. To see photos, traveler tips, and tourist information, go to the Hallstatt online trip planner . You can drive from Innsbruck to Hallstatt in 3 hours. Other options are to take a bus; or take a train. Finish your sightseeing early on the 8th (Wed) to allow enough time to drive back home.